A few months ago, I told my best friend that I had learned to drive in silence in the car- without music. “That’s so sad,” she said. I knew what she meant. She and I always shared a love for singing together. In fact, last month we drove an extra half mile out of our way so we could get in ALL of Journey’s “Don’t Stop Believin. '” Damn, we sounded good, too. I know it. What I meant to say to her (and as usual, said very badly) is that I didn’t need music to distract me so much anymore- that I was okay being alone with my own thoughts in a way I hadn’t been before. 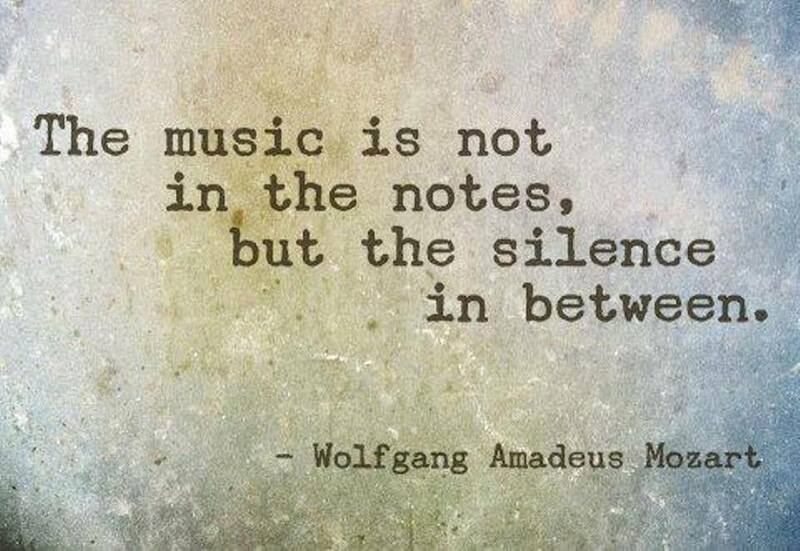 The quote above- Mozart- makes me feel that way. The silence is not only necessary (otherwise, how to hear the notes?) but a lovely thing that can be music in itself. But: this week, I’ve been struck with a wicked cold and have had to stay home much more than I ever like to do. I hate, hate, hate not working. It makes me feel guilty and shameful. Yesterday, doped up on cough medicine, I woke up from a nap in a panicky sweat, sure something was wrong. Why was I home? Why wasn’t I teaching? Was everything falling apart?! My super-charged (and unnecessarily zealous) work ethic aside, I’ve had to face the fact that it is just really hard for me to be away from people. I don’t want anyone to get sick, and I have been pretty contagious, so ethically I know I’m doing the right thing- but ugh. I miss the companionship- sharing with them, even if it’s just on that “hey, I see you” sort of energetic level of exchanging a smile. I didn’t always feel this way about it- remember this post?– but I’ve come to accept that I thrive when I am around other people. Sure, I’d rather be a little choosy about which people (I’m not that enlightened)- but I love the interdependence of it, the harmony, the music that we make together. Every day, someone in my life does something just to be nice to me- and I do something for them, too. We have so much to give each other. We don’t exist in isolation. Sometimes, after a yoga class, when I see my students talking to each other, no longer separated on their little mats but engaging in community, you can hear the hum of voices, the music they make together, and it’s such a beautiful thing, my heart grows at least three sizes bigger. They’re talking about their kids, or where to get good food, or a shared pain, or a new joy. In my house tonight, in the silence, there’s a music here, too. One that’s important for me to practice- an aloneness that is beautiful. I hear the ceiling fan. A dog sighing. Laundry in the washer. My own turbulent thoughts. This silence between the notes is a lovely music. But, given the choice- my heart longs to share life with others. Maybe, someday, one special other? This post was inspired in part by the following poem- enjoy, friends. electricity, the voice, the words. This entry was posted in Uncategorized on November 22, 2013 by laurasana. My favorite of all your blogs…thanks for sharing. Feel better, and have happy, HEALTHY holidays in the month to come. Love you.